It is time to choose a new Book of the Month! Today, Abby the Labby gets to pick, and she’s quite excited… because we are bribing her with a treat to keep her sitting down and posing for this photo. What’s it gonna be? She knows I don’t want another edjoo-ma-cative read after January’s “The Happiness Project” and February’s “Nikon D3300 for Dummies.” She also knows that I am fond of historical fiction, and have picked up two recently. “Hild,” is book number one by Nicola Griffith, who, through much research created a novel about what 7th century Britain would be like for the woman who would be later known as Saint Hilda. This book came highly recommended by staff at a favorite small bookstore. Book number two is “The Mistaken Wife,” third in a series including “The Blackstone Key” and “The Counterfeit Guest,” all by Rose Melikan. 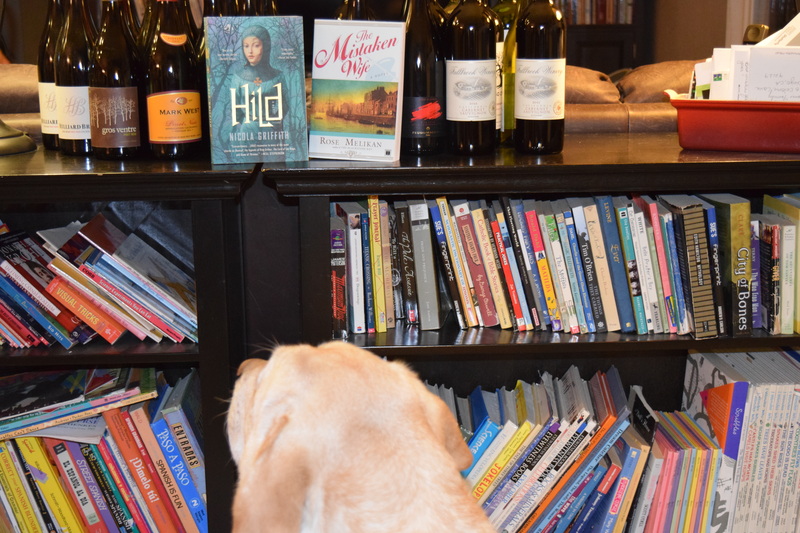 Sure looks like she is leaning toward “Hild,” and check out all the wine we won at the school’s raffle! We’ve NEVER won anything like that, WOO HOO!! 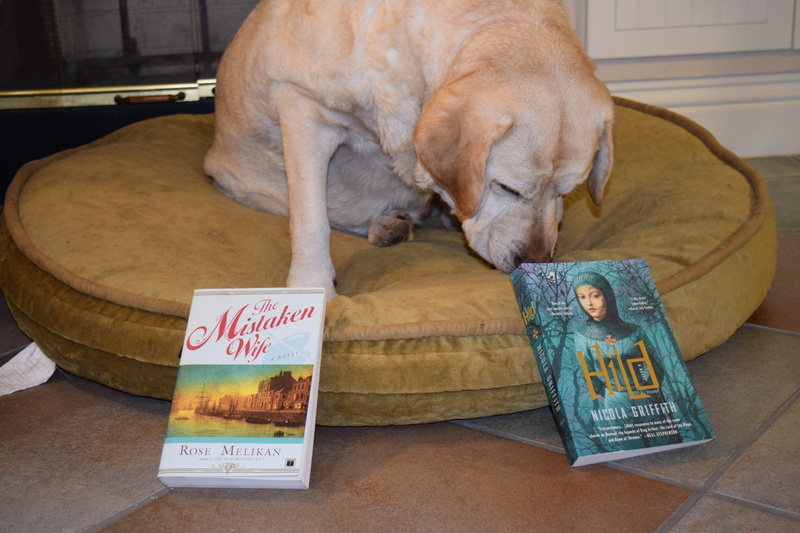 IT’S “THE MISTAKEN WIFE!” But, how do we know which one Abby chose? It came down to which book she drooled on, honestly. Remember, we had treats for her, and she was quite aware of it. Maybe she also knew that I already read Melikan’s first two stories about Mary Finch, reluctant heiress and even more reluctant spy during the close of the 1700’s. Either book presented a win-win situation for me- I’m a sucker for well researched historical fiction, And Harry Potter. If you ever feel like discussing the minutiae of that universe, I’m your Potterverse Pal.